Gov. Shumlin at a press conference in February. As he prepares for a third run for the state's top office, Gov. Peter Shumlin has accumulated more than a million dollars in his campaign account, according to documents filed Monday with the secretary of state's office. Since Vermont politicians were last required to disclose their fundraising and spending activities in July 2013, Shumlin has raised nearly $329,000 — the majority of which came in the form of large contributions from out-of-state donors. In that same period, the governor's reelection campaign spent just $20,000. In a written statement, campaign treasurer Kate O'Connor said that the incumbent's fundraising prowess "demonstrates continued strong support for Gov. 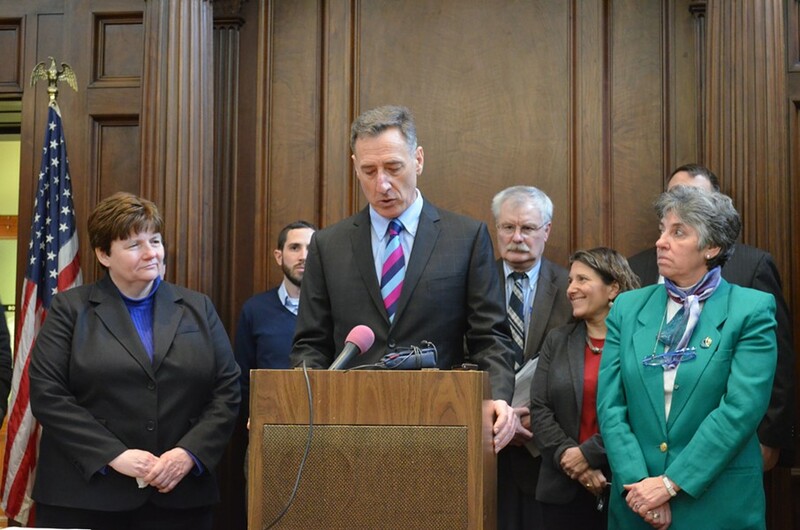 Shumlin's efforts to strengthen and protect Vermont's quality of life." Perhaps just as important for Shumlin, Monday's filings provided no new clues as to whether any formidable candidates will challenge the governor this November. Only perennial candidate Emily Peyton has said she'll run for governor — this year as a Republican. The only other potential gubernatorial candidate to file a report was former state auditor and senator Randy Brock, who challenged Shumlin in 2012. Brock, who loaned his campaign $300,000 during that race, contributed another $18,250 to his campaign account last July, according to the filing, and then promptly cut a $17,500 check to his 2012 advertising consultant, Ohio-based Strategy Group for Media. Brock said Monday that the new loan in no way indicated interest in a second gubernatorial campaign — and that the new payment related to his last bid for office. "It's just basically cleaning up from the last campaign, nothing more," Brock said. Among Vermont's other statewide officeholders and aspirants, Attorney General Bill Sorrell was the only one to crack the five-figure mark. Sorrell, who has no declared challenger, raked in $25,800 during the past eight months — every penny of it from outside Vermont. In that period, the AG spent just $2,230 on campaign expenses. Sorrell said he learned a valuable lesson in 2012, when he faced a stiff challenge from Chittenden County State's Attorney T.J. Donovan and was out-raised by his fellow Democrat. Though Donovan announced in January that he would not challenge Sorrell in 2014, the incumbent said he continues to prepare for a contested campaign. "Forewarned is forearmed," he said. "I didn't want to just sit on my hands and not raise any money and then all of a sudden have a significant race on my hands, so I wanted to get ahead of where I was two years ago. It's not like I've been spending a lot of time fundraising — and I haven't spent any time doing in-state fundraising." Sorrell said the "lion's share" of his campaign cash came from a fundraiser he held in January at a meeting of the Democratic Attorneys General Association in Orlando. Most of Sorrell's contributions come from law firms and prominent attorneys, several of whom previously served as attorneys general in other states. Lt. Gov. Phil Scott, a Republican, raised $8,500 and spent $1,645. Treasurer Beth Pearce raised $1,506 and spent $1,138. Secretary of State Jim Condos, a Democrat, raised $101 and spent $580. Auditor of Accounts Doug Hoffer, a Democrat and Progressive, raised and spent no money. Among those who filed reports Monday were four Republicans seeking to challenge incumbent Democratic and Progressive state senators. All four previously announced interest in running. They include Dustin Degree (Franklin County), Robert Frenier (Orange County), Joy Limoge (Chittenden County) and Pat McDonald (Washington County). Vermonters First, a conservative super PAC that raised and spent nearly a million dollars during the 2012 campaign season, remains somewhat active, its latest filing shows. Founder and chief donor Lenore Broughton of Burlington contributed another $10,000 to the group last August. That month, it paid the Virginia-based polling firm Public Opinion Strategies $9,000 for what it listed as "research." The group also paid treasurer and consultant Tayt Brooks' firm $4,000 last summer. Brooks declined to comment on Vermonters First's activities.